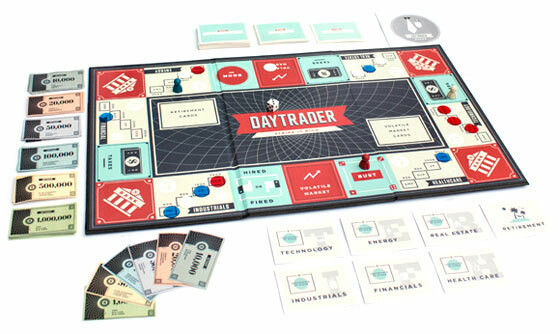 Daytrader is a financial board game that brings you the thrills and chills of investing in the stock market. This is your chance to become a fast thinking, investment-savvy day trader; but first... get a job! First, work at the companies on the board to scrape together some cash so you can make trades in the companies you work for. The more employees a company has, the higher the company's stock price. Buy a company's stock when it's priced low and sell it when it's high to maximize your gains and create greater wealth. When you have enough cash to retire be the first to get to the bank before the volatile market sets you back. If you can do that, you win! Bring the trading floor to your dining room table with Daytrader! Add a Review for "Daytrader"